Feature Models (FMs) are a key artifact for variability and commonality management in Software Product Lines (SPLs). In this context, the merging of FMs is being recognized as an important operation to support the adoption and evolution of SPLs. However, providing automated support for merging FMs still remains an open challenge. 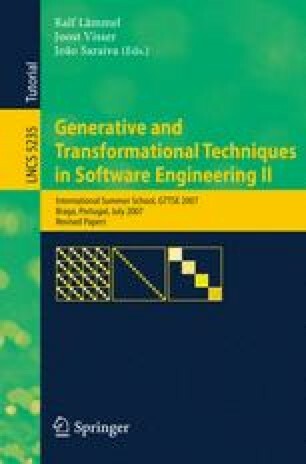 In this paper, we propose using graph transformations as a suitable technology and associated formalism to automate the merging of FMs. In particular, we first present a catalogue of technology-independent visual rules to describe how to merge FMs. Next, we propose a prototype implementation of our catalogue using the AGG system. Finally, we show the feasibility of our proposal by means of a running example inspired by the mobile phone industry. To the best of our knowledge, this is the first approach providing automated support for merging FMs including feature attributes and cross-tree constraints. This work has been partially supported by the European Commission (FEDER) and Spanish Government under CICYT project Web-Factories (TIN2006-00472) and the Andalusian Government project ISABEL (TIC-2533).